The 15th conference of the Association of Heterodox Economists took place last week. The keynote theme of this gathering of economists who are not of the mainstream was inequality. The world’s greatest economic expert on inequality of wealth and income is Tony Atkinson, or should I say, Sir Anthony Atkinson. Atkinson is senior research fellow at Nuffield College, Oxford and a distinguished econometrician. Atkinson’s address was entitled “Where is inequality headed?”. Inequality is back on the economic agenda after being ignored for decades by mainstream economics. But official spokespeople and mainstream economists everywhere are now looking at the subject, after the financial crash and the revelation that the top 1% (bankers and top corporate executives) have been stacking up their ‘earnings’ while the 99% have been stuck with unmoving real incomes for years. Atkinson was careful to define inequality for his purposes: namely inequality of income within a country, not inequality of wealth or income between countries. In previous posts (https://thenextrecession.wordpress.com/2010/01/10/20/), I have referred to the groundbreaking work of Branko Milanovic from the World Bank who has shown that the biggest inequalities of income and wealth are engendered by the gaps between the rich and poorer countries rather than inequalities between rich and poor within a country. But Atkinson concentrates on inequalities within countries. Atkinson reckons that the best measure of inequality of income is between households, not individuals, and after tax and benefits have been distributed. This household disposable income includes not just earnings from work but also capital income (rent and interest and dividends). On this measure, Atkinson has an interesting story to tell about the changes in inequality of incomes in the advanced capitalist economies. Using the gini coefficient, which measures average inequality across the spectrum of households, Atkinson finds that in the OECD economies there has been a rise of about 3% pts in the coefficient from about 28 to 31 since the 1980s, or a rise of about 10%. This confirms the evidence of the OECD that in a recent post (https://thenextrecession.wordpress.com/2013/05/17/inequality-theres-no-stopping-it/) I had previously referred to. Adding to that OECD study, Atkinson pointed out that between 1911 and 1950, inequality of income actually declined slightly, reaching its most equal point (still pretty unequal) in the years immediately after WW2. But from the 1980s it rose sharply. Interestingly, the largest rise in inequality in the UK was in the 1980s during the Thatcher years, when the gini ratio rose a staggering 10% points, briefly exceeding the US by the early 1990s. The other shocker was the rise in inequality in social democratic Sweden, which now no longer has a more equal society, at least as measured by disposable household income. In contrast, inequality of income in France fell a little during the same period. Atkinson then asked the question: why? What were the causes of the rise in household inequality of income in the advanced capitalist economies after the 1980s? The usual reason given by mainstream economics is that new technology and globalisation led to a rise in the demand for skilled workers over unskilled and so drove up their earnings relatively. This is the argument presented by Greg Mankiw recently in his defence of the top 1% of earners (https://thenextrecession.wordpress.com/2013/06/19/defending-the-indefensible/). Atkinson dismissed this neoclassical apologia. The biggest rises in inequality took place before globalisation and the dot.com revolution got underway in the 1990s. Atkinson pinned down the causes to two. 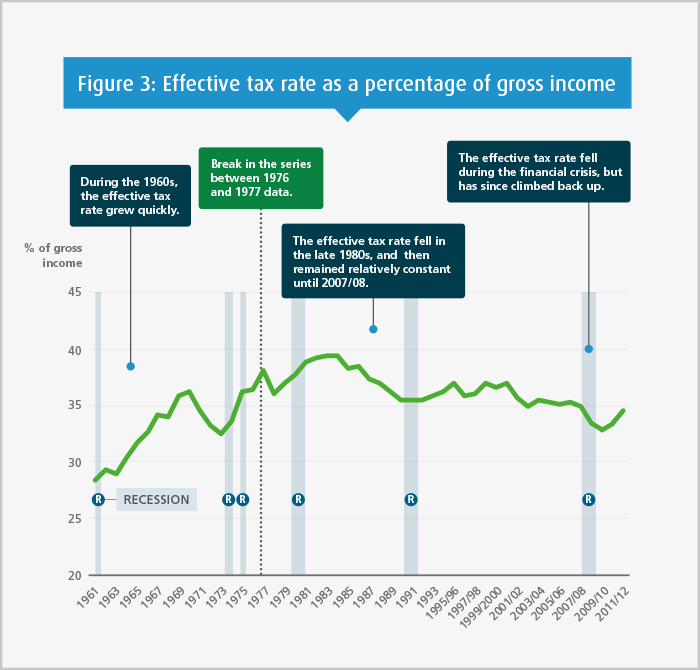 The first was the sharp fall in direct income tax for the top earners under neoliberal government policies from the 1980s onwards and the sharp rise in capital income (i.e. income generated from the ownership of capital rather than from the sale of labour power). The rising profit share in capitalist sector production that most OECD economies have generated since the 1980s was translated into higher dividends, interest and rent for the top 1-5% who generally own the means of production. In 2011, capital income constituted 60% of the top 10% earners’ income compared to just 32% in the 1980s. Higher returns from capital have been coupled with lower taxes on capital and on the income earned by the top earners. The total effective tax rate is the total amount paid by households in both direct and indirect taxes as a percentage of their gross income. In the UK, the effective tax rate grew during the 1960s and 1970s from 28.4% in 1961 to a peak of 39.4% in 1983. But from then on, under Thatcher, Major and New Labour, the trend has been downward, reaching a low of 32.8% in 2009/10, before increasing slightly over the last two years to 34.6%. As a result, even though the rich pay more in tax than the poor because they earn more, the bottom 20% of households now pay more in tax as a percentage of income (36.6%) than the top 20% in the UK (35.5%)! The other key issue on inequality is whether it is the main reason for the last global crisis. Many leftist and some mainstream economists reckon that restricted incomes for the lower income groups caused the Great Recession because consumption and ‘effective demand’ weakened and because households resorted to taking on more debt to compensate for the lack of growth in the incomes from work. I have argued before in previous posts that rising inequality was not the cause of the Great Recession of 2008-9 or the ensuing Long Depression now being experienced in the mature capitalist economies of the OECD (see my posts: https://thenextrecession.wordpress.com/2012/05/21/inequality-the-cause-of-crisis-and-depression/ and https://thenextrecession.wordpress.com/2011/10/21/1-versus-99/). But this argument persists and many papers at this year’s AHE conference pressed on with this argument with some evidence. Edward Glaesar also points to research on the US economy that home prices in various parts of the US did not always increase where there was the most income inequality. That calls into question the claim that income inequality was inflating the housing bubble. And Glaesar refers to Atkinson on this: “Professors Atkinson and Morelli’s international data also suggest little regular connection between inequality and crises. Looking at 25 countries over a century, they find ten cases where crises were preceded by rising inequality and seven where crises were preceded by declining inequality.” Moreover, inequality was higher in two of the six cases where a crisis is identified, which is exactly the same proportion as among the 15 cases where no crisis is identified. It is one thing to recognise that inequality has rocketed in the last 30 years and quite another to claim that this explains the credit crunch and the Great Recession. What is wrong theoretically with this argument is that it assumes, as the Keynesians do, that the fundamental weakness of capitalism lies on the demand side of the economy. Since many people had insufficient incomes to consume, they borrowed money to maintain their living standards. Radically different conclusions follow if the problem is located on the supply side (with the cause to be found in profitability). From this perspective, falling profitability explains the sluggish character of the productive economy and is at the root of the crisis. If the economy had been more profitable, there would have been less need for such a rapid or ‘excessive’ expansion of credit. From this perspective, the widening of inequality is more of a symptom than a cause of economic weakness. The rich became richer with the emergence of the asset bubble, but the underlying economy was far from healthy in the first place. What is decisive for capitalism is surplus value (profit, interest and rent), not wage income or spending. Control of that surplus is key. The main feature of the last 100 years of capitalism has not been growing inequality of income – indeed, as Atkinson shows, inequality has not always risen. 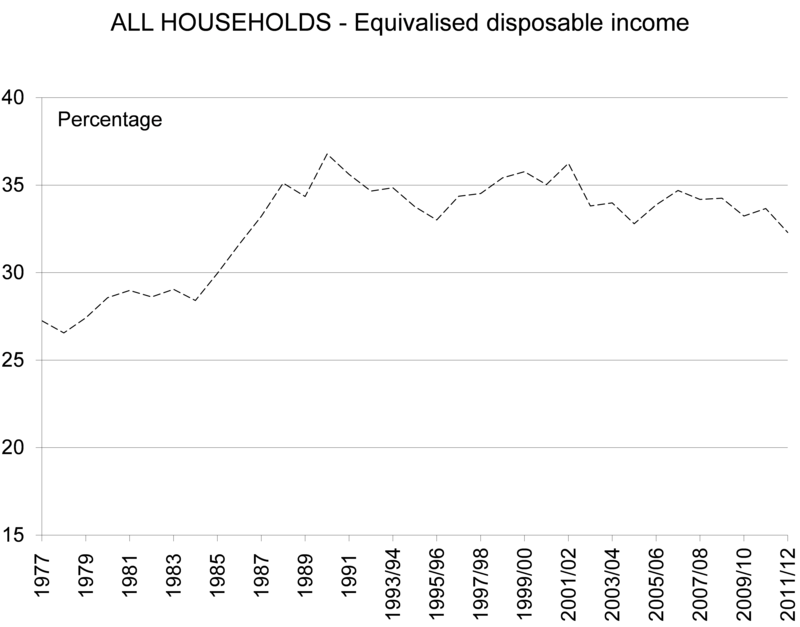 The main feature has been a growing concentration and centralisation of wealth, not income. And it has been in the wealth held in means of production and not just household wealth. A new study shows how far that has gone in the recent period. Three systems theorists at the Swiss Federal Institute of Technology in Zurich have taken a database listing 37 million companies and investors worldwide and analyzed all 43,060 transnational corporations and share ownerships linking them (147 control). They have a built a model of who owns what and what their revenues are, mapping out the whole edifice of economic power. They discovered that a dominant core of 147 firms through interlocking stakes in others together control 40% of the wealth in the network. A total of 737 companies control 80% of it all. This is the inequality that matters for the functioning of capitalism – the concentrated power of capital. There were other themes at the AHE conference, in particular the claim by Keynes that capitalism would achieve prosperity for all and increased leisure for all within 100 years of the 1930s. I have dealt with Keynes’ arguments in a previous post (https://thenextrecession.wordpress.com/2013/05/04/keynes-being-gay-and-caring-for-the-future-of-our-grandchildren/) but I’ll return to that issue and also the paper that I presented on cycles in capitalism in a future post. This entry was posted on July 14, 2013 at 4:04 pm and is filed under capitalism, economics, Profitability. You can follow any responses to this entry through the RSS 2.0 feed. You can leave a response, or trackback from your own site. between 1911 and 1950, inequality of income actually declined slightly, reaching its most equal point (still pretty unequal) in the years immediately after WW2. But from the 1980s it rose sharply. Interestingly, the largest rise in inequality in the UK was in the 1980s during the Thatcher years, when the gini ratio rose a staggering 10% points, briefly exceeding the US by the early 1990s. 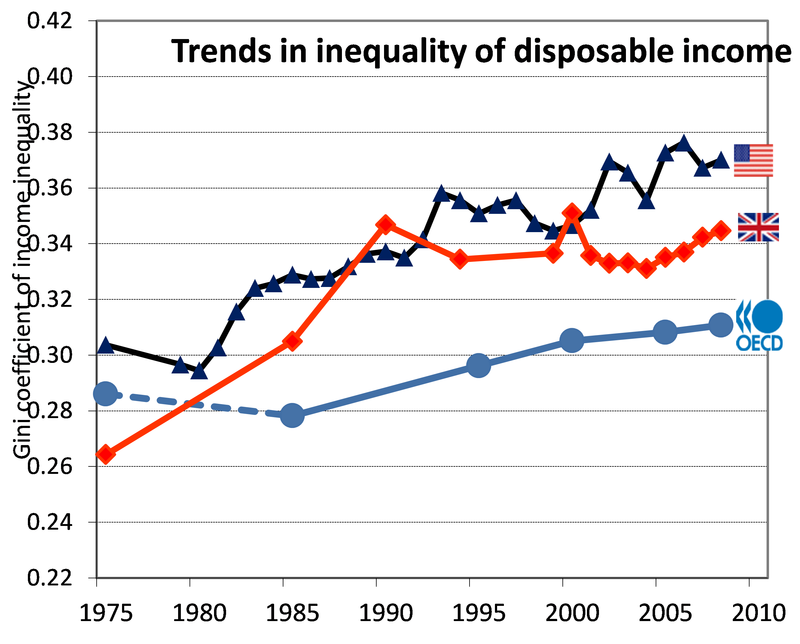 The other shocker was the rise in inequality in social democratic Sweden, which now no longer has a more equal society, at least as measured by disposable household income. In contrast, inequality of income in France fell a little during the same period. Margin or profit arises from the difference between the cost of producing something and the sale price. When pricing power is low due to insufficient demand resulting from low incomes of those with a high propensity to consume , it’s only natural that profits will be harder to come by. The only pricing power that remains today is for high-end goods and services on the one hand and for absolute essentials on the other. To say this is a supply problem vs a demand problem is semantics – the origin is clear. Small- and medium-sized firms no doubt have much in common with low- and middle-income households , both in regards to their consumption/investment propensities ( as opposed to accumulation/hoarding ) , as well as in their increasing reliance on debt financing as they’ve received an ever-shrinking share of the gdp pie. I think if someone would compile the combined income , consumption , and debt data over time for the top 0.2% of individuals PLUS firms , and compare it to the bottom 99.8% , a pretty clear picture would emerge. Everyone seems to focus on either people or firms exclusively , as if there’s no connection between them. Wealth is accumulating at the top because that’s the way the wage system operates. The rate of profit problem has been dealt with by holding real wages down though class ruled State enforcement. The wage system is having some difficulty maintaining its equilibrium but, most producers (employed and unemployed) are still convinced that wage labour is the only realistic way to conduct life. Capitalist politicians promise reform and that seems good enough for the citizens within the boundaries of nation States. Meanwhile, trillions of dollars accumulate for capitalists and landlords of the world in the tax free havens of the Caymen Islands etc. Is there any chance that your recent paper co-authored with Guglielmo Carchedi will appear freely on the web? I mean this one: http://wrpe.plutojournals.org/ArticleDetails/tabid/345/ArticleID/654/The-Long-Roots-of-the-Present-Crisis-Keynesians-Austerians-and-Marx%C3%8Ds-Law.aspx Unfortunately, WRPE is a journal that is not widely subscribed by libraries. Is it the paper you referred to in the entry on Michael Heinrich? I’ll get it made available to all as soon as I can – probably on my next post. No, it is not our (Carchedi and Roberts) reply to Heinrich. We have submitted a reply to Heinrich to the Monthly Review where Heinrich’s original piece appeared and MR will publish a series of comments on the Heinrich paper with a reply by him shortly. We are also planning a fuller piece for another journal shortly. An Australian Labor Party MP, Andrew Leigh, has just recently published a new book on the story of inequality in Australia, “Battlers and Billionaires”. There is a need for a critique: he is an academic researcher in the area, but he is also a neolaboral, ie a slightly damp neoliberal. Is it possible to request the “Carchedi & Roberts” article in WRPE directly from you …now? I have a draft version in word that may do. Could you send me the paper “carchedi&Roberts” by email: eleuterioprado@uol.com.br? Although I fail to detect the link to the draft version of “Carchedi & Roberts” here, I do download the published version(!) successfully from WRPE by legally registering a ‘free trail’; In any case…thanks for the help and your great posts/papers.